Young Morgan Penfold during his Posh debut against Norwich. Photo: Joe Dent/theposh.com. 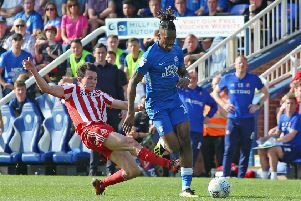 It was a night to forget for those Peterborough United fringe players hoping to break into the League One starting line-up. Posh manager Grant McCann made seven changes to the side that played wonderfully well to beat MK Dons 2-0 away from home on Saturday (August 27), but none impressed as a young Norwich side thrashed Posh 6-1 in the opening Checkatrade Trophy tie of the season tonight (August 30). Posh midfielder Callum Chettle tackles James Maddison of Norwich City. Photo: Joe Dent/theposh.com. Morgan Penfold: (for Maddison, 72 mins).